I never learned how to swim and it's one of my biggest regrets. I very much want to learn, but several near-drowning incidents have left me aquaphobic. I promised myself that I would not pass this fear onto my children. I put them in water from when they were a few weeks old so they could become accustomed to it. My daughter loves the water. She will start swimming lessons this summer. And my infant son is not far behind thanks to Fred's Swim Academy SWIMTRAINER "Classic." The SWIMTRAINER "Classic" is a brilliant device that will help teach your baby or child to swim. It facilitates the ideal swimming position in the water so your baby can learn how to move his legs and arms correctly. 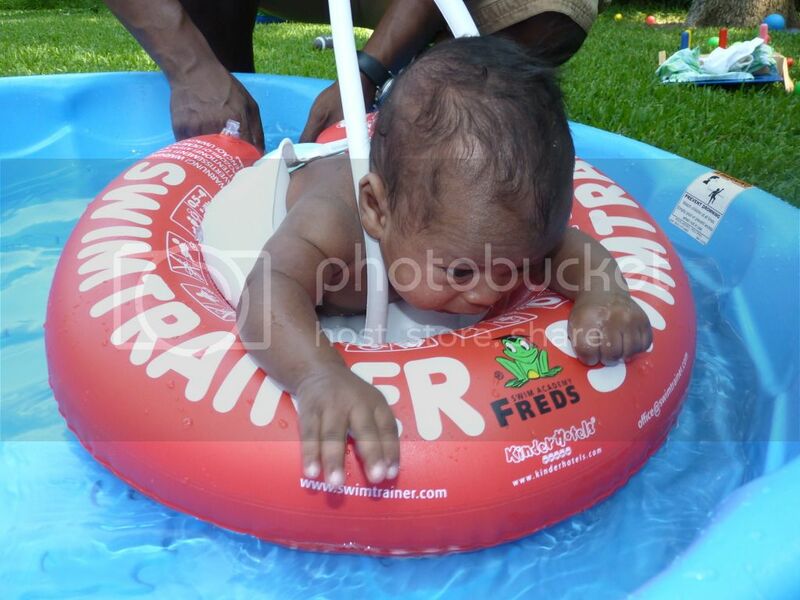 We put Desmond in it this past weekend in the kiddie pool and you should have seen him kicking his little legs just like a frog! He still has some growing to do so his arms can reach the water. I cannot wait until he is older so we can give him more practice! It's sturdy! The safety belt and pads give me complete confidence that my little one will not sink. On that note, constant supervision is required. An adult should stay within arms reach when using the SWIMTRAINER "Classic" on a baby. The device was easy to set up too. It just needs air. I tried to blow it up by mouth like the woman in the video, but couldn't do it. Maybe my lungs aren't as robust as they used to be, I don't know. We borrowed a friend's air compressor to inflate it and we were ready to go! Every child should have a SWIMTRAINER. Buy It:The SWIMTRAINER comes in three stages according to the child's age and learning ability (red, orange, yellow). Purchase yours today for $24.90 at Thanks Mama! Buy It: You can try to win a SWIMTRAINER of your choice from Thanks Mama in my Summer Splash Giveaway through May 27. Enter Now!